A female entrepreneur is always an asset to a nation, especially someone who has passionately built, from scratch, an organisation with a focus on developing the future young talents of India rather than thinking about commercial factors – MS Taranjit Kaur Mander of Jalandhar is one such lady. An ordinary woman, working for one of the oldest college’s of Punjab as a lecturer in languages, Taranjit always held her childhood passion in heart. Her Grandfather, who was the chief supervisor of the community kitchen of the Maharaja of Patiala, taught his family hospitality, culinary skills and many royal delicacies. His teaching techniques led to her success in many cooking competitions and sparked Taranjit’s interest in entrepreneurship. Her interest grew and she further honed her skills under the tutelage of MS Balbir Singh and renowned Chef Kishan Thapa, now professionally based in Germany. In 1984, a group of professors approached Taranjit to learn cookery skills to aid them in career progression. Gaining confidence from these experiences, in 2001 she quit her job and started full-fledged culinary skill programmes for budding professionals. Rana Cooking School was born in Jalandhar and was named after her younger brother Mr Ranbir Singh, most fondly known as Rana. Slowly but surely more branches were established. 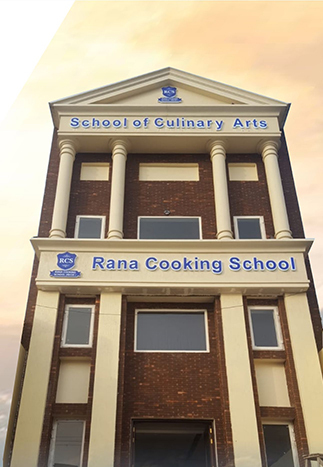 At present Rana Cooking School has expanded with seven branches in major cities in Punjab. Taranjit always carried the vision of sharing knowledge and life skills and creating a Culinary University; the first of its kind in India. Her son, a qualified chef, has carried forward her legacy, taking the 35-year-old business to the next level by creating state of the art, modern facilities within a fully equipped culinary school. History will remain history, but looking to the future, Rana Cooking School has a mission to create World Class chefs, with expertise in the finest of Indian cuisines from across the length and breadth of the country, to serve an international community. We promise to transform budding chefs into specialists of Indian cuisine and professionals of the highest standard. To become a world class educational provider committed to rigorous and comprehensive training in classical and contemporary Indian culinary skills and hospitality, with an emphasis on hands-on experience, instruction from leading industry experts and advanced skill development. Cultivating a hands-on culinary training programme, with a holistic approach to professional development, offering entrepreneurial instruction and leadership skills for students to secure leadership roles within the hospitality industry internationally.